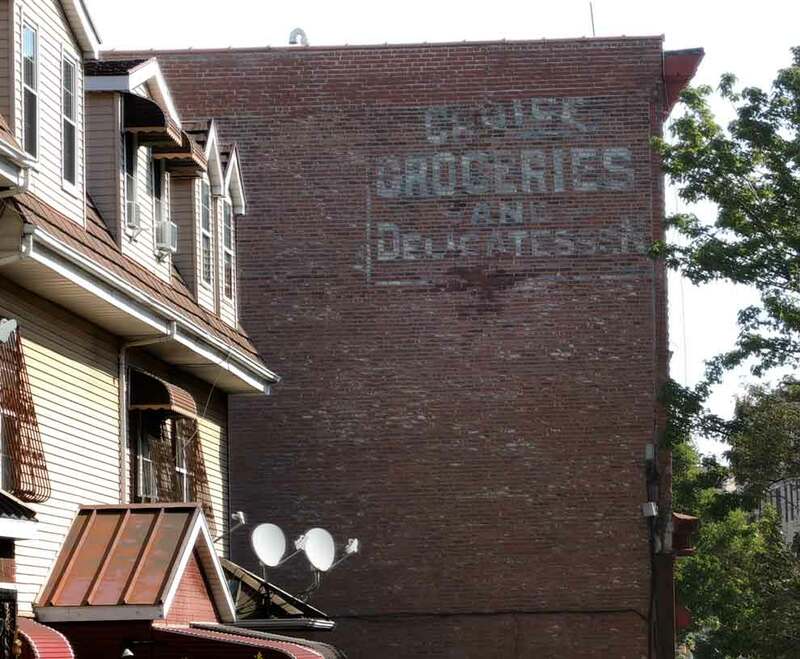 The sign seems to say Choice, Choles, or somethink like that, but 989 Home Street was the home of A. Cronemeyer, Groceries from 1908 to 1917. Albert George Cronemeyer (1871-1944) was proprietor. The residential part of the building, with entrance at 1201 Vyse Ave, was Cronemeyer's residence from 1908 until his death in 1944. Alfred Cronemeyer was listed in New York city directories as a grocer in the Bronx, first in 1893 at 1353 Boston Road, at 1360 Stebbins Ave. in 1895, and then in 1899 at 1234 Home St. After 1917 he was in business until around 1922 on Havemeyer Ave. and East 177th Street. In addition to his own business, from 1914 to 1918 Alfred Cronemeyer was listed as an officer at Robert Cronemeyer & Co., grocers, at 1132 Walker Ave., the Bronx. President at Robert Cronemeyer & Co. was Heinrich L. R. Cronemeyer, whose full name was probably Heinrich Ludwig Robert Cronemeyer. How Heinrich L. R. Cronemeyer was related to Alfred Cronemeyer is unclear. Alfred Cronemeyer was recorded in several U. S. and New York State census reports. These included the 1900 U. S. Census when he was 29 years old, born February 1871, Germany, immigrated 1888. In 1900 he lived at 1234 Home St., the Bronx. He remained a grocer through the 1920 U. S. census, but in the 1925 New York State census his occupation is given as "Mfg. of Pastels." I may be misreading the handwritten "pastels," but from this point it seems Cronemeyer was now out of the grocery business. The 1930 U. S. census gave his occupation as "Painter General," and the 1940 census had "Mechanic Hand Soap." The Cronemeyer name in Germany was probably spelled with a K, Kronemeyer.